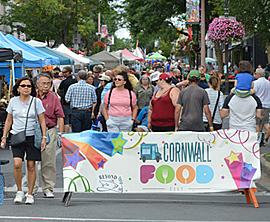 Cornwall Ontario – There will be some big wheels in Lamoureux Park on August 19th. 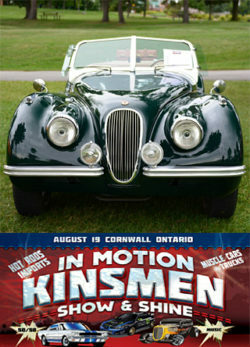 The Kinsmen Club of Cornwall is bringing back the 4th annual In Motion Show & Shine car show. 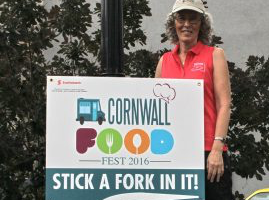 After a regretful cancellation of last year’s event, organizers are excited to bring back the best vintage rides in the Cornwall area. The event kicks off at 9:00 am between Pitt Street and First Street where different models of all car, bike and truck makes will be showcased for the community to admire. The Visitors can expect to see a mix of muscle cars, classics, old antique and imports ranging from different years. The show runs until 4 pm and admission is free. There is a $10 fee for vehicle owners, and all proceeds will go toward local organizations such as Big Brothers / Big Sisters. The impressive cars are not the only thing to see on August 19th in the downtown district. In partnership with Beyond 21 FoodFest and CoTICon, there will be more than 14 gourmet Food Trucks and different merchants just a block away along the Foodies Lane between Second and Third Street. For the geek culture enthusiasts, they can take a short walk down to the Bandshell to say hello to Super Mario at Cornwall’s only cosplay convention. 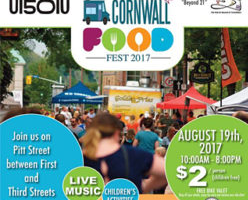 The Ontario 150 Culture Stage will be set up at the corner of Pitt and First and will feature various local talent such as Kelli Trottier and the McCulloch Dancers. There will also be live entertainment in the Licensed Entertainment Tent near Fantasy Realm going from 11:00 am until 8:00 pm. Performers include the Campbell Trio, Steph McAlear, and Nick Seguin. Other attractions include the Kinsmen Family Zone located in Pommier Square. There will be face painting, giant Jenga, crafts booth, and much more for the whole family to enjoy. Parking for the car show goers will be from Water Street to First Street, and the remainder will be set down at the outer edge of Lamoureux Park. Spots will go on a first come, first served basis.